Horror in Samaria: A terrorist infiltrated the West Bank settlement of Itamar, southeast of Nablus, early Saturday and stabbed five family members to death. The shocking attack occurred around 1 am as the terrorist entered the family home and murdered three children aged 11, 3, and a baby girl along with their parents. The victims were apparently sleeping as the killer came in. 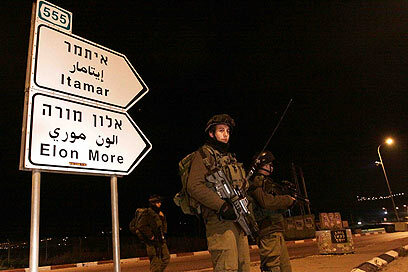 Itamar residents reported that shots were heard in the area; the terrorist managed to flee the scene. Three other children at the home, a 12-year-old girl and her two brothers, aged 6 and 2, were able to escape to a nearby house and inform their neighbors of the attack. The terrorist who carried out the massacre cut the fence surrounding Itamar and entered the home of the victims through the window, an initial probe of the murder showed. Authorities could not immediately discount the possibility that more than one attacker was involved in the murder. Following an initial report of the incident, large IDF and police forces rushed to the site. The Air Force also joined the effort to track down the terrorist, deploying numerous aircraft in the area. The night’s sky was lit up with flares, as special IDF and police forces were called in to assist in the manhunt. 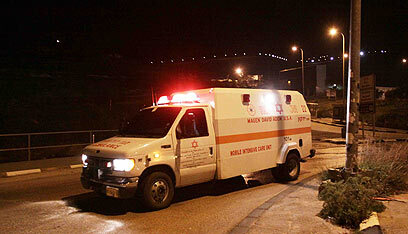 Magen David Adom ambulance service teams pronounced the victims dead at the scene. MDA spokesman Zaki Heller said the ambulance service got a call around 1 am and dispatched large teams of paramedics to the area. “The parents were lying next to each other in their room…we found three bodies in the master bedroom; the two parents and a baby,” he said. Yesha Council Chairman Danny Dayan, who arrived at the site, appeared shocked by the brutal attack. “This is no doubt one of the most terrible attacks in recent years," he told the reporters on hand. “The time has come for the government to regain its senses and start backing up the settlement enterprise, which remains vulnerable on the frontlines,” he said. The settlement of Itamar, which is surrounded by Palestinian villages, has been the site of murderous attacks in the past. In June of 2002, a terrorist entered the community and opened fire, killing Rachel Shabo and three of her seven children, Neriya, Tzvika, and Avishai. Yossi Twito, who commanded the local security team at the settlement, was also shot to death in the attack. See all talkbacks "Horror in Samaria: Terrorist murders family of 5"